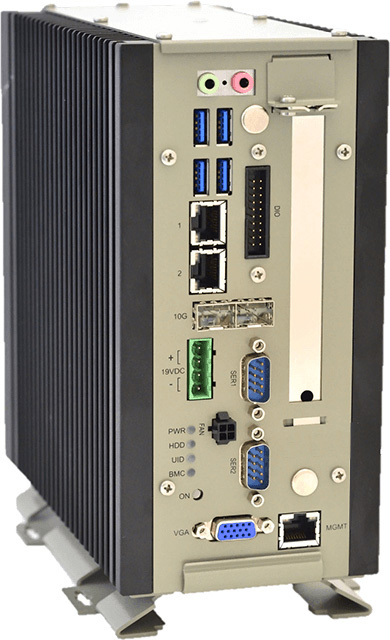 HQ-BOX is a series of rugged compact embedded fanless servers, based on Intel® Xeon® D-1500 server CPU’s embedding up to 16 Cores, 128GB DDR4 ECC, 2x 10Gb SFP+, and more features for embedded systems with support high performance computing with multiple IO peripherals under extended temperature range. Typical HQ-BOX applications include Multi-Access Edge Computing (MEC), Edge Servers, FOG Servers, Radio access networks (RAN), Industrial automation and control, IoT Gateway, Private Cloud, Microserver and more. Display – VGA Standard VGA display over DB15 connector, using the HX-A24 BMC. Maximum Display resolution: 1920×1200 32bpp@60Hz. I/O – Audio Stereo audio out and mono mic, using 3.5mm earphone socket. Environmental – Operating Temp. Standard: 0°C to 50°C. Shock & Vibration As defined by ETSI standard ETS 300 019-1-5, 5M2 profile.